Unlike most commercial powders that rely on talc (a questionable ingredient) we’ve chosen corn starch, oat flour and French white clay to absorb moisture and soften skin. A special herb – powdered slippery elm – is also added because of its traditional use as an anti-irritant. corn starch, oat flour, french white clay, slippery elm powder, capryloyl glycine (amino acid), fragrance (essential oils & natural extracts). 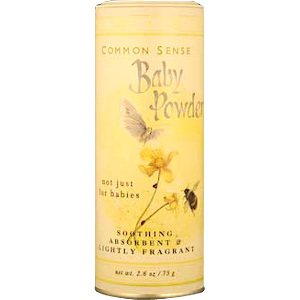 Baby Powder is shipped in a discrete, unmarked package. Orders are processed immediately and usually take about 3 to 5 working days to be received. Any information received is used only for order processing and shipping purposes. Your information, such as e-mail address, will never be disclosed to a third party.